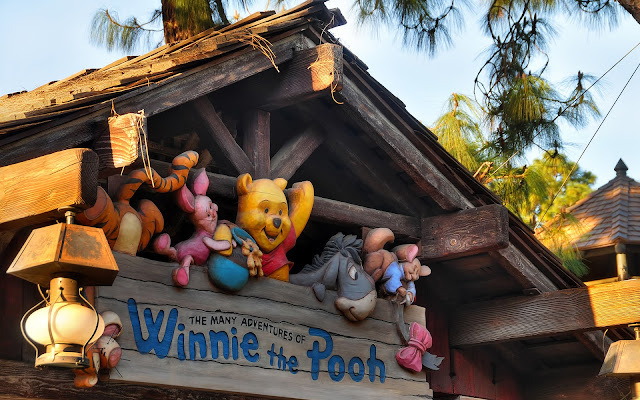 So Winnie the Pooh may not be as highly regarded of a dark ride as its Fantasyland brethren, but it's still a cute attraction that will make Winnie the Pooh fans happy. Of course, it could be Tokyo Disneyland's Winnie the Pooh, which uses radio controlled trackless ride technology to create a truly dynamic and incredibly innovative experience, but that might have been above the prescribed budget at the time. Basically, what I'm trying to say is... I have writer's block for the first time ever while I'm writing this blog post, and I'm too lazy to wait and see what more interesting things might come to me later. Hey, it was bound to happen sometime! In the meantime, if you haven't, go "Like" Disney Photoblography on Facebook and follow "@DisPhotoblography" on Instagram! It's a great way to check out old photos, especially if you're newer to the blog and want an organized way of checking out oldies but goodies! We waited in a pretty long line for Pooh's Hunny Hunt, and I could see why. We walked off and I had the biggest smile ever. And I had no idea what the characters were saying!! It's one of my favorite Disney attractions. That's awesome. I hope to make it over there one day soon!